A workplace is sometimes similar to change. Although there are a handful of people who stay, there are still those who leave. Nothing is constant in a workplace and different people come and go, and that is exactly why it is considered similar to change. Because of these changes, every company or organization needs to adapt the changing situation or they will fall apart. Adaptation process that has been practiced by millions of companies throughout the world is the onboarding plan. There are a lot of different steps involved in the process of onboarding and the steps vary depending on what skills and knowledge an individual needs for the job. Ensuring that all the necessary things are covered requires the use of a tool that lists them all. That tool is none other than an onboarding checklist. 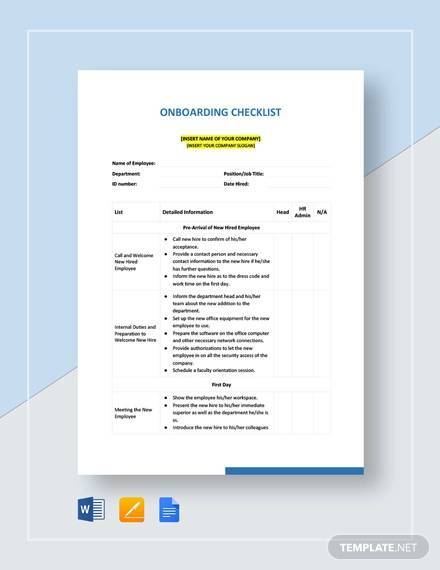 Different onboarding checklist samples and checklist templates are provided below for you to view and download. Check them out now! 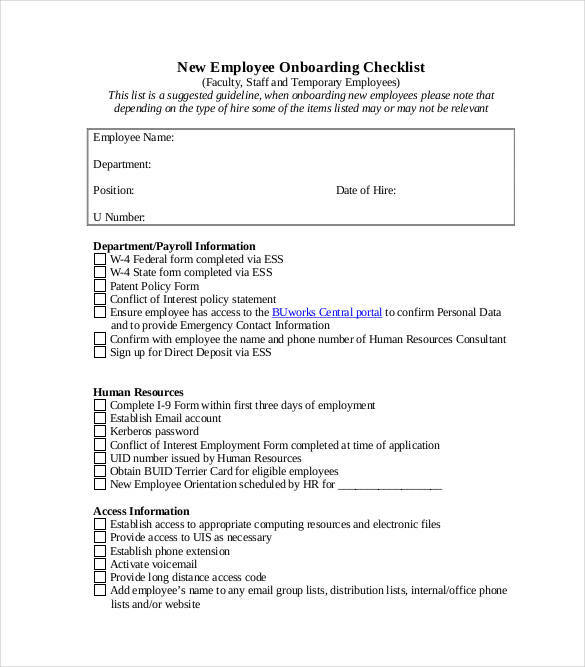 What Is an Onboarding Checklist? Whenever there are new people who join a group or new employees who get hired in a company, they are always introduced to every member of the group or the other employees in the company. But before the introduction part, employees undergo orientation to brief them on what is going to happen and what they are required to do. Orientation and introduction are some of the many steps involved in an onboarding process. Onboarding is the process by which employees gain knowledge, skills, as well as the right behavior to become an effective member of a company or organization through socialization. It is often referred to as organizational socialization. Since it is a process, it involves different activities and the need to monitor the new members every step of the way. The onboarding process is a lengthy one that spans from one year up to two years. It is not an easy task. What makes it even more difficult is the number of employees or individuals who need to undergo the onboarding process at the same time in a given span of time. That is why it is a must that an onboarding checklist be utilized for this process. 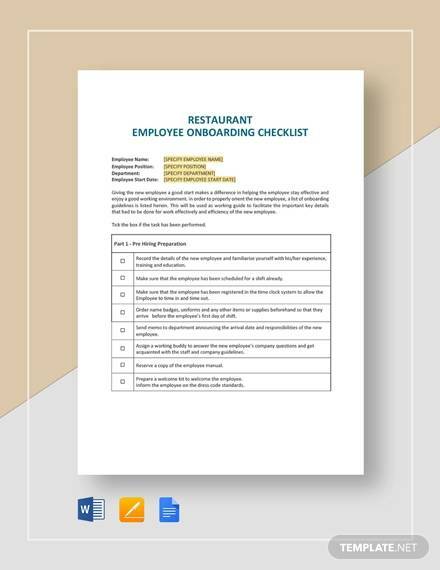 An onboarding checklist includes a list of the necessary steps and evaluations needed for duration of the onboarding process. The list is different from one company or organization to another because different companies or organization follow their own evaluations. This makes every onboarding checklist unique. An onboarding checklist is used so that integrating a new employee to the culture of the organization is made in a timely manner. The checklist makes it possible for all the necessary steps in the onboarding process be covered and ensures that the employee is able to gain the necessary knowledge and skills inventory required from them. 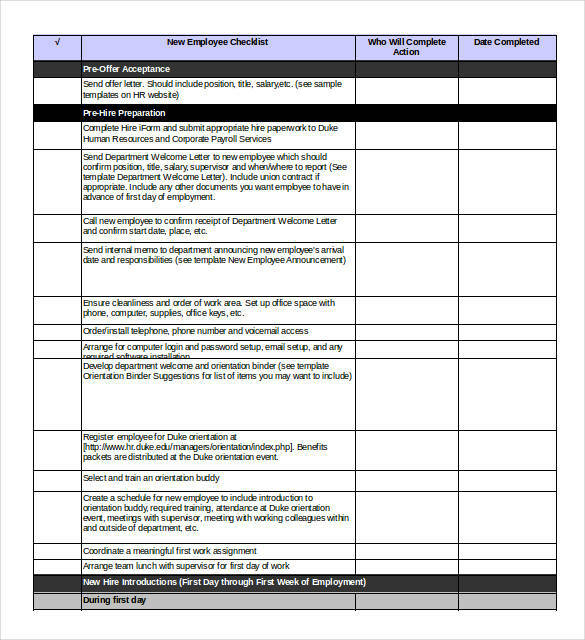 Another use of an onboarding checklist is to make the routine monitoring of a new employee or newly appointed staff easy and convenient. Other checklists samples you might be interested in are cleaning checklists samples, daily checklist samples, and HR checklist samples, to name a few. Is There a Difference between Onboarding and Induction? Onboarding and induction are often used interchangeably because a lot of us think that they mean exactly the same. If you look up both words in the dictionary, you will be even more convinced that they actually mean the same thing. It is until you try to investigate if they have any differences. That is the time you’ll find out the truth. So to save you the hassle of searching for that truth, we have created a list of the differences between onboarding and induction. As mentioned above, onboarding is a process of introducing new employees or new individuals into an organization and how they do things, and not just to the people who they are going to meet and work with. Onboarding is more on integrating a new member to the culture and behavior of the people they are going to deal with in an organization. It also helps them acquire the necessary knowledge and skills that they need in order to be an effective member of the organization. There is a plan on what is going to happen to the new member and what is being required of them in the organization. The activities involved in the onboarding process include orientation, training, introduction, and routine monitoring and evaluations to ensure that they have properly been integrated into the organization. The onboarding process often lasts 1 to 2 years. Induction is more on the introduction of an individual or an employee to the organization itself. It is more like an announcement that there are new people who are going be part of the company or organization. Aside from being introduced to the different personalities in the organization, they are provided with a brief overview of what the organization does and their processes. There is no actual plan on what is going to happen to the new member after getting hired or accepted in the organization and after induction. The activities involved in an induction checklists are orientation, training, and introduction of the new member as officially a part of the organization. There are many different reasons for using a checklist and each one of them are important. A checklist can be used in the workplace, during emergency situations, when preparing or cooking for a meal, and to provide a chore schedule for the family. A checklist is important because it helps in the organization of various tasks and activities to make sure that they are done in an orderly and timely manner. A check or X mark is drawn on any task written on the checklist that you have already accomplished. This is the perfect visual aid for any individual to determine their progress for the day. 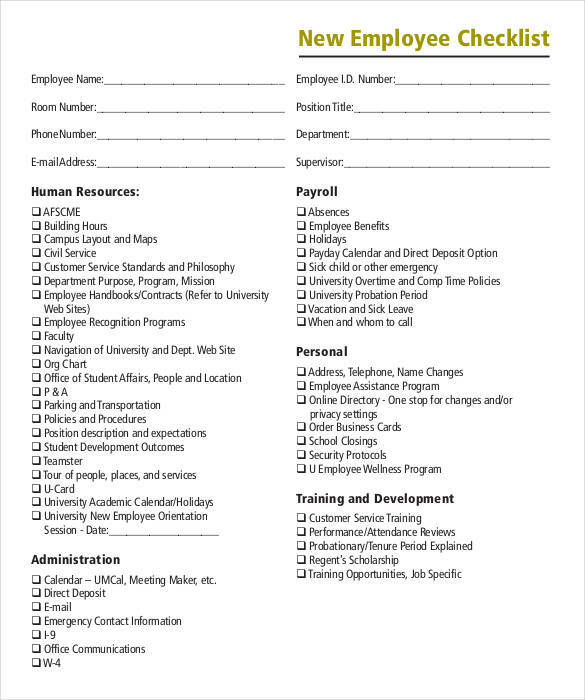 A checklist helps different people of different profession remember the tasks that they set themselves to do as a well as the tasks that are assigned to them. A checklist is where you can list a series of tasks. 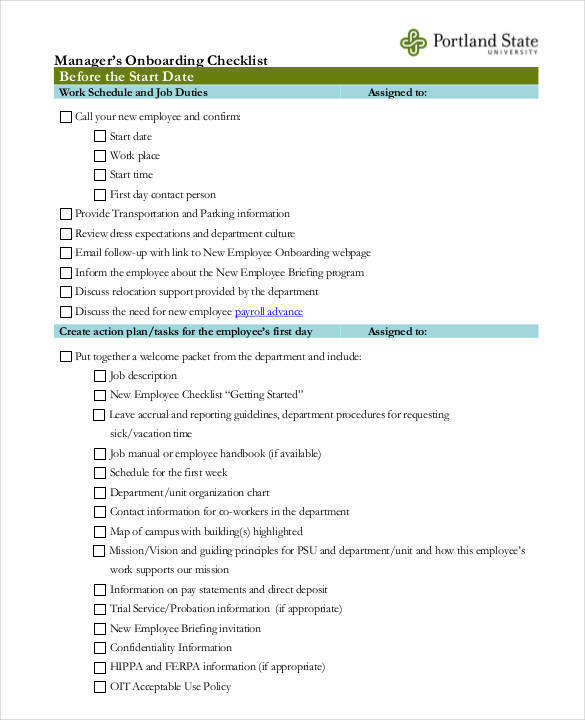 The use of a checklist allows for the establishment of a daily routine, either personal or work-related, which greatly helps individuals create a productive and organized lifestyle. It helps in the prioritization of tasks making sure that those that are important are done first. The checklist serves as a reference for any tasks, jobs, or projects that need to be done before a given deadline. A checklist helps in the proper allocation or task, especially when there are multiple groups or several people assigned to work on the same tasks. Another reason why checklists are important is because they allow for the proper planning of the tasks or activities that are ahead. So much time can be saved with the utilization of a checklist in any field or industry. This is because you already know what you need to do, which means you won’t be easily distracted with other things that are not related to your tasks. Using a checklist helps you set a goal, whether for personal purposes or for your work. Now that you know how important it is to use a checklist, you will surely be interested in checking out other checklist-related articles that we are offering. 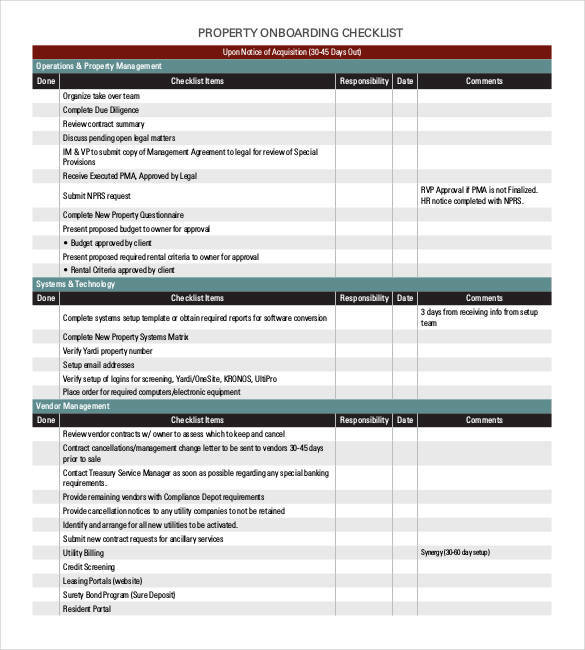 To name a few are compliance checklists samples and templates, construction checklist samples and templates, and partnership agreement checklist samples and templates. What can you gain with using a checklist? Most people would ask this question before they start to actually use something, like a checklist. I mean, what is the point of using one if you can’t get benefits out of it? There is more to a checklist than being a tool to list your tasks or activities and we have made a list of them below. It helps you save brainpower and energy. Have you not had enough of forcing yourself to remember what important thing you need to do, squeezing your brain for the information that you so desperately want? You struggle on something that you can write down on a checklist so that you can check it out later on? This way you can save your brainpower thinking about other more important stuff. You can save a lot of time. We can never bring back time, so might as well save a lot of it and that can be made possible with a checklist. By consulting your list, you are able to determine the tasks that you have planned ahead, thus helping you focus on finishing your tasks. If you have focus on your work, you are sure to get things done a lot easier and earlier. Prevents the possibility of doing the same tasks twice. The the check mark or X mark on your checklist is an indication that the task has already been completed allowing you to proceed to the next tasks. Because in the first place, why would you want to do the same task knowing you have already done it? Helps you become motivated and productive. Seeing how you fared for the day and how much you have accomplished will surely motivate you to work harder and do more. The mark on your checklist indicating the number of tasks you have completed will make you feel good about yourself and will fire you up to aim higher than you used to. Serves as your task reference. Not all tasks are enjoyable and these tasks are often the ones that always get overlooked. But with a checklist, there is no overlooking of any tasks even if you hate that task so much. 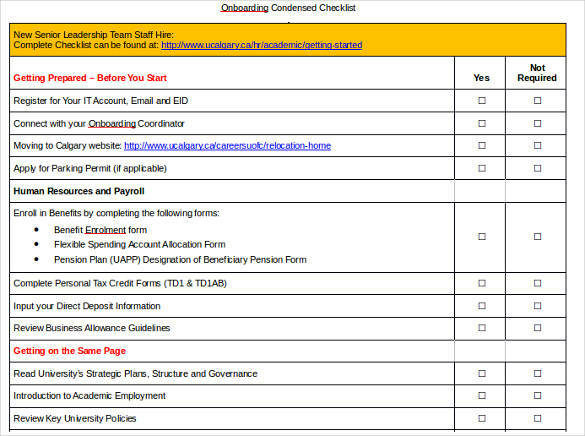 The checklist will serve as your reference for all the tasks that should be done, whether they are enjoyable or not! Can be used for different purposes. You can use a checklist to improve customer service, You can use a daily checklists for your personal tasks or perhaps use a business start-up checklist to help you go about building your own business. There is almost no limit to what you can do with a checklist. The templates are readily available online and are mostly free. 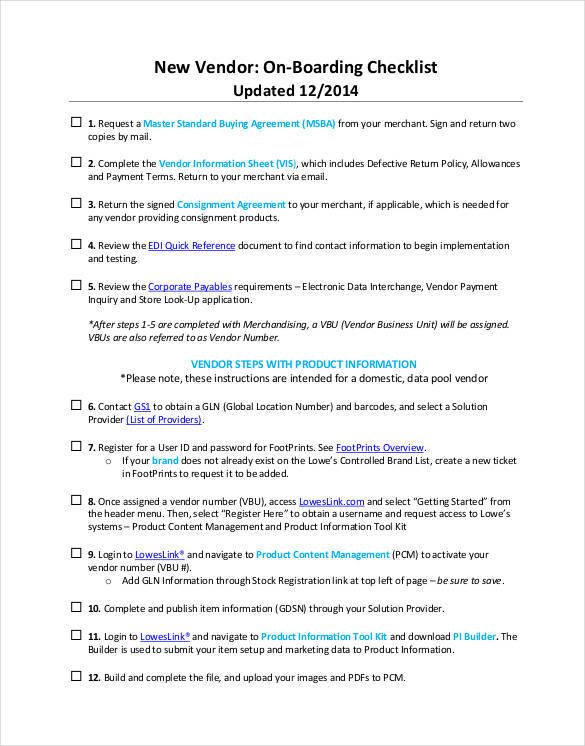 Checklist templates are not hard to find and definitely not hard to obtain. Millions of websites online offer different varieties of checklist templates and more than half of them are offered for free. If you can’t find one, then you must really be bad at searching. Helps you become organized and stay organized. In what way can a checklist help you organized? If you use a checklist to list down errands, appointments, homework, cleaning schedule, and many more, you will be able handle these tasks with ease just because you have them written. In addition, you will gain a sense of discipline as you continue using it. You will never miss out on a task ever again. How can you forget about something that is written? You won’t if you happen to use a checklist. Saying you have overlooked it will sound just like a very lame reason. It could either be that or you just intentionally didn’t look at your checklist. When do you say that a tool is effective or not? You say it is effective when you are able to reach your goals just by using it. You say it is not effective when nothing is actually happening. So a lot of people have been unsuccessful with using a checklist and this all boils down to the fact that they are not using it properly, and not because it is really not useful. To be able to use a checklist effectively, you will need to check out the tips below. Keep your checklist neat and organized because it will attract you to want to check it out more often. If you consult your checklist more often, then you will know the list of tasks that are waiting to get done. For starters, write only what you are sure of completing within the day. There is no point in writing a lot of tasks when you can’t finish all of them within a particular time frame. 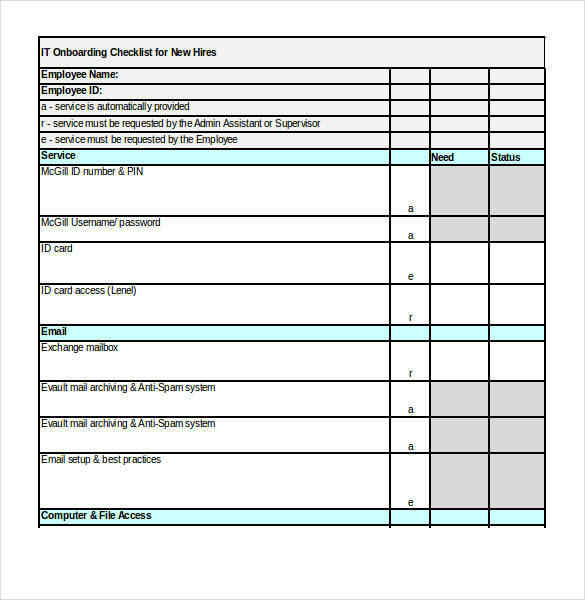 Use checklists templates to make it easier and convenient for you to start working on your checklist. 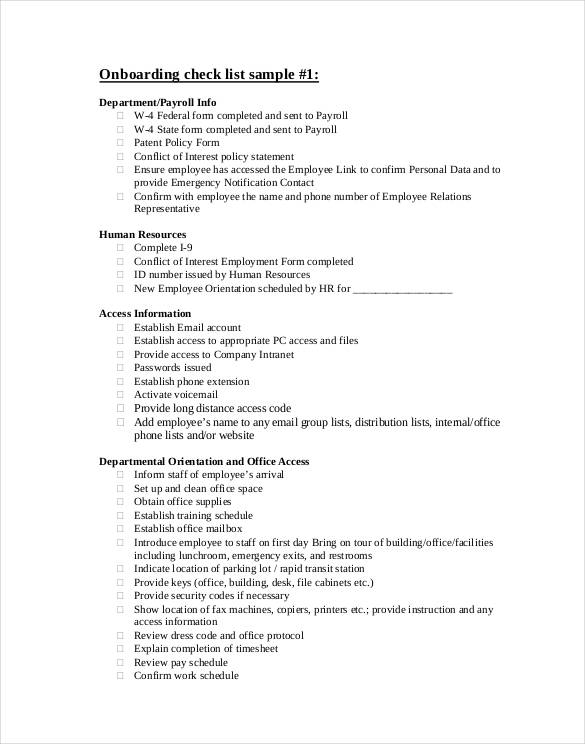 That way you don’t have to draw lines and check boxes every time you a add an item or start a new checklist. Do not leave any tasks for the day undone and never decide on doing them the next day because you will soon find yourself doing it every single day, and the list of undone tasks increases until such time that it is impossible to handle. If you can decide on what tasks to list down, then you can use checklist samples as your reference. Always mark the tasks that you have finished every time you are done with them. Use a small notebook or something handy as your checklist so that you can bring it everywhere you go and use it anytime you need to. If you feel like creating your own checklist, then you might want to check out our website. 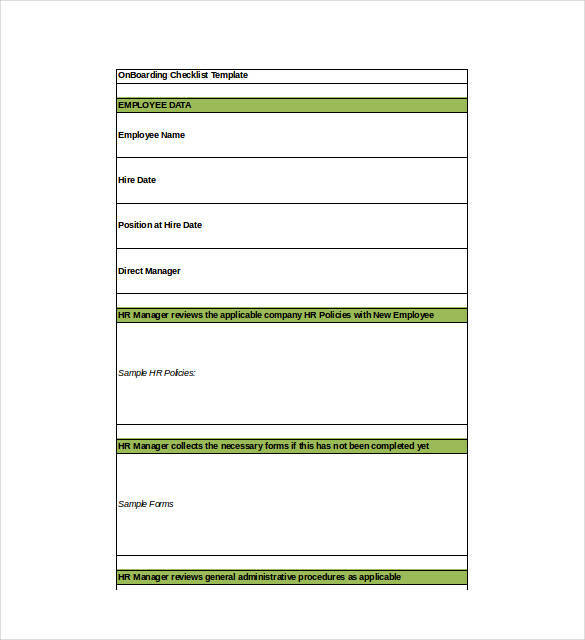 We have a variety of checklist templates that you can choose from such as vehicle inspection checklist templates, risk assessment checklist templates, and audit checklist templates.